MAXQDA lets you create frequency tables and corresponding charts for both document and code variables. 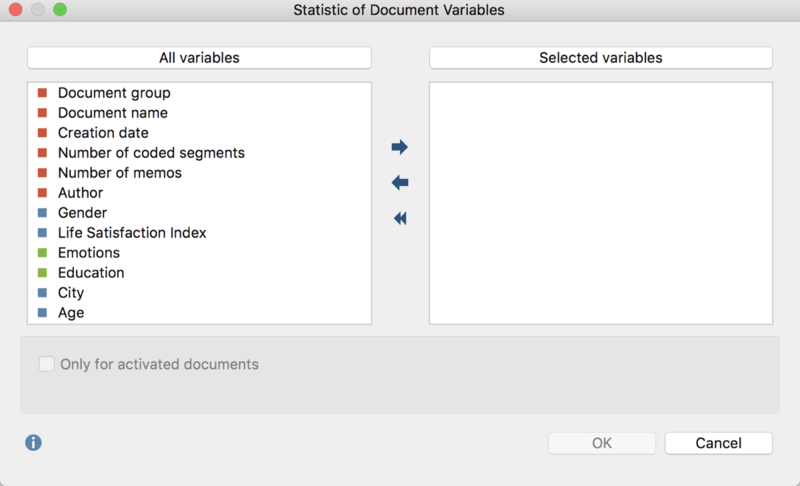 You can open this function from the ribbon menu: Variables > Document Variable Statistics and Code Variable Statistics. The split “Choice of Variables” window is displayed below: On the left side, all existing variables are listed; on the right, the selected variables. The arrow buttons in the middle allow you to transfer variables from one window to the other, i.e. for selection for analysis or removal from the selection list. You can also do this by double clicking on the variable name. Please note:To select multiple variables, hold down the Shift, Ctrl (Windows) or cmd (Mac) key. Please note: System variables that are created and managed by MAXQDA are marked in red; codes that have been transformed into variables are marked in green. Both lists can be alphabetized by clicking on the column headers. By selecting Only activated documents you can limit the analysis to currently activated documents, for example the transcripts of selected interviewees. The corresponding option Only activated codes is also available for code variables. Tip: The statistics functions for variables can also be accessed directly with the icon in the „List of document variables“ and „List of code variables“. MAXQDA then begins the statistical analysis for only the selected variables, then considers all documents or codes. When you click OK MAXQDA will begin the statistical evaluation and display the results as frequency tables and charts. The results window displays the results of the first selection of variables in a table. The “Frequency” column shows how many of the analyzed documents contain the variable value in question. Tip: Click on the column headers of the first two columns in order to modify the order of the table rows. For example, you can sort the frequency of categories in ascending or descending order. The first column lists the various categories of the variable; the second column lists the absolute frequency; and the third lists the corresponding percentages. The fourth column shows percentages based on valid values, meaning missing values are excluded. If there are no missing values among the variables in question, the percentages of the third and fourth columns will be identical. You can customize the order of the rows within the table by clicking on the column header of the first and second columns. For example, you can sort the table in ascending or descending order in regards to categorical frequency. When you switch to the chart view with the button, a bar chart of the variables in question appears in the place of the table view. Note: The order of chart segments is determined by the order of the rows in the table, and can be modified accordingly. Display labels – hide or show categorical labels of bar and pie charts on the x-axis. Display data values – hide or show the data label, meaning frequency of variable values or subcodes. Display percentages – show relative, rather than absolute frequencies. Display missing values – hide or show missing values category. Display legend – hide or show the legend, which is switched “off” by default in bar charts. 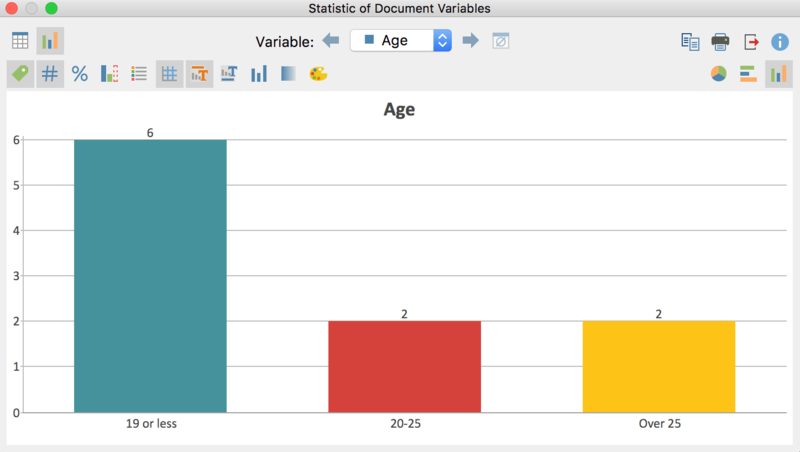 Display scale – hide or show the scale axis in bar charts. Display title – hide or show diagram title. Display text – hide or show textual description of diagram. 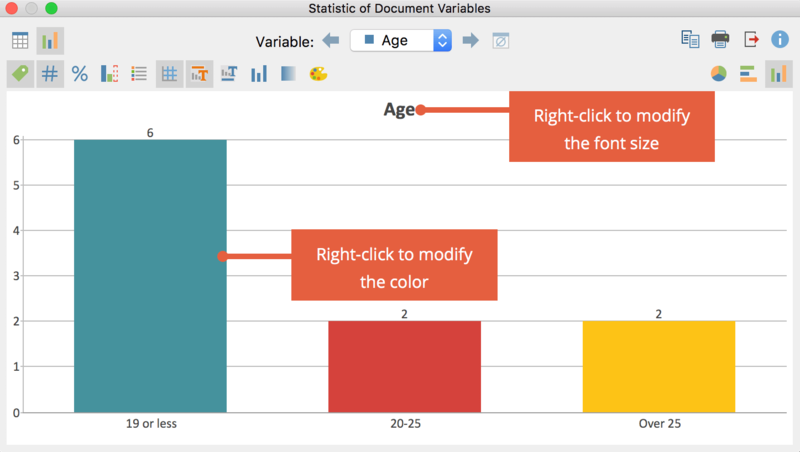 When creating charts, MAXQDA sets an initial color scheme. To customize your charts, double-click on the selected segment and choose your desired color. Click on the Change color scheme button to select between three preset color schemes. Like frequency tables, charts can be printed and exported. Charts will be exported in PNG format, or as vector graphics in SVG format. For numerical and text variables, values set as “Missing values” in the “List of variables” will be treated as missing. For text variables, blank fields will also be treated as missing. When evaluating numerical variables the Descriptive statistics symbol is appears in in frequency tables. Clicking on the icon produces an output of the usual parameters such including mean value and variance.